The shed in back of 626 Third Avenue S.E. on the afternoon of Dec. 27, as seen from the street. The shed you see here may be leveled and replaced with a 528-square-foot garage, the Albany Landmarks Advisory Commission voted Wednesday. But it took two public hearings and a month’s delay to reach that conclusion. Why all this red tape for knocking down an old shed? Because the property, 626 Third Ave. S.E., lies in Albany’s Hackleman Historic District, where city law obligates owners to get Landmarks’ approval of new structures. 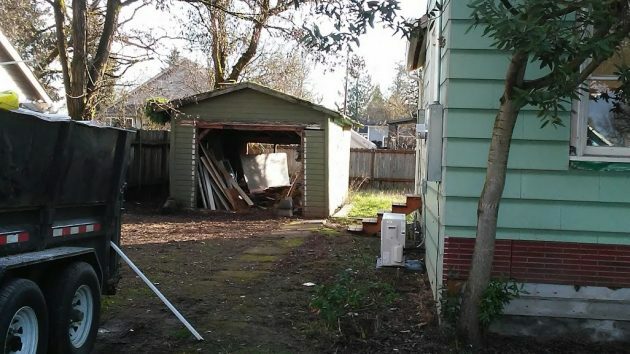 And because at the first hearing on Dec. 5, Albany resident Camron Settlemier contended that the shed, like the house it sits behind, should be considered a “contributing historic” landmark, so the owner would need approval for its demolition before the replacement garage could be allowed. The city planning staff disagreed, saying that accessory structures like this had never before been considered historic. And while a 1980s survey of historic structures in Albany mentioned the outbuilding as well as listing the house, it didn’t actually evaluate the shed for its style or contribution to Albany history. Still, the landmarks board wanted clarification and put off the decision until Wednesday. A couple members who had argued for the delay were absent Wednesday. And the four commissioners present — David Abarr, Cathy LeSuer, Larry Preston and chairman Bill Ryals, voted to let the new garage be built on the site of the old one. Preston, who had recused himself a month ago but joined the discussion Wednesday, said there was nothing historic about this shed and he saw no problem with the proposal before the board. Gary Hodgson, of Renu Development, is working on the property. He told the landmarks board in December the outbuilding was in “terrible shape and falling down.” The property is under contract to be sold, and the new owner wanted a new garage. It will be made to look similar to like structures in the neighborhood. As in this case, the landmarks board sometimes gets caught in fights over whether to save or demolish old structures. Last fall it refused to allow immediate demolition of three old houses at Fourth and Calapooia Street. The city council partially overturned the board, but an opponent appealed that decision to the state Land Use Board of Appeals, where it remains. Now that the state wants more accessory dwellings in single-family areas, a mandate Albany is still trying to accommodate with a local code change, Bill Ryals of Landmarks is proposing that Albany find new ways to achieve more housing and save historic buildings at the same time. He mentioned one approach Wednesday: If single-family properties in the historic districts have outbuildings that are truly historic, add their square footage to whatever maximum size Albany allows for accessory dwellings. This would turn the outbuildings into economic assets that owners would want to preserve and adapt rather than raze to make room for additional housing. A wider view of the property that was the subject of a hearing in December. The hearing was continued Wednesday. What a colossal waste of time and money! We went through this same peversion of the attriubute of ‘historic’ structures the summber before last at our house. In our case it was a deck, built in the 1980’s. Our house dates from the 1890s. We have owned our house since ’97 and love historic homes. We are in agreement that they should be preserved where possible, and are good stewards of our own home. However, this deck is not historic. We have talked personally with the owner of the house from that time. They put it up themselves, as the back door on our historic house is 4 feet off the ground and needed somewhere to go. It’s a simple square deck built at that level off the ground. However, after 30 years, the wood was deteriorated and a safety hazard. We wanted to replace the deck with a deck low to the ground, so it would be easier to access from the yard. We wanted a small platform off the back door with just steps going down to the deck. Well, the builder went to the city with the plans, which were rejected. The deck had become ‘historic’, as it is listed in records. 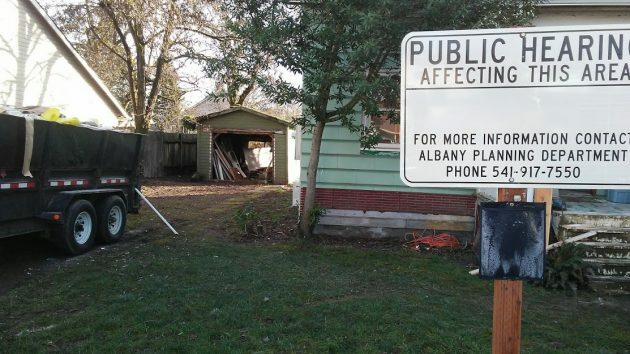 We could go through an expensive appeal process, notify all our neighbors of our plans and see if they objected. Then they *may* have approved it. So what we decided to do instead was to repair the deck, which the city allowed without the more elaborate process. We submitted photos of the current deck, showing the rotten wood, and stated what we would do to repair it. This was allowed it seems. We had to preserve all that we could of the original, but we could replace the rotten wood. We had to keep the dimensions, elevation, stairs, exactly as it was built by the owners in the ’80s. So today the deck is finished. The original posts in the ground are twisted and warped (as the city said they had to stay), but the flooring on the deck is at least firm and smooth and not rotten now. This corruption of ‘historic’ to cover sheds, decks, etc. built by home owners (frequently by themselves) is wrong. As a side note, not long after this we were shopping around for home owners insurance. Allstate would not cover us, in part due to the dimensions of the stairs on our deck. The stairs, while in good condition now, have dimensions which they deemed not up to todays standards. These were the stairs the city forced us to keep. Sheesh. When you own one of these homes in the Albany’s Hackleman Historic District, you know what you’re getting into, it’s an HOA on steroids. You’re giving up some of your bundle of private property rights to government. I love the area and the historic concept, but I don’t want David Abarr, Cathy LeSuer, Larry Preston and chairman Bill Ryals in my life telling me what to do. That doesn’t mean in the future that I wouldn’t mind taking on one of those projects, just not at this point. Do your due diligence before you purchase and hire an agent that knows the Albany market. Absolutely true! Sadly, it seems many homeowners (and even some developers) can’t be bothered to do so – and then complain when they get caught in the process. All of the folks on the board are doing their job within the rules they are bound by. I have no problems with that. I enjoyed the suggestion at the Dec. 5th meeting that a new garage be built in front of the old one so it could be preserved. Think of all the possibilities of two garages in a row, how useful and historic.